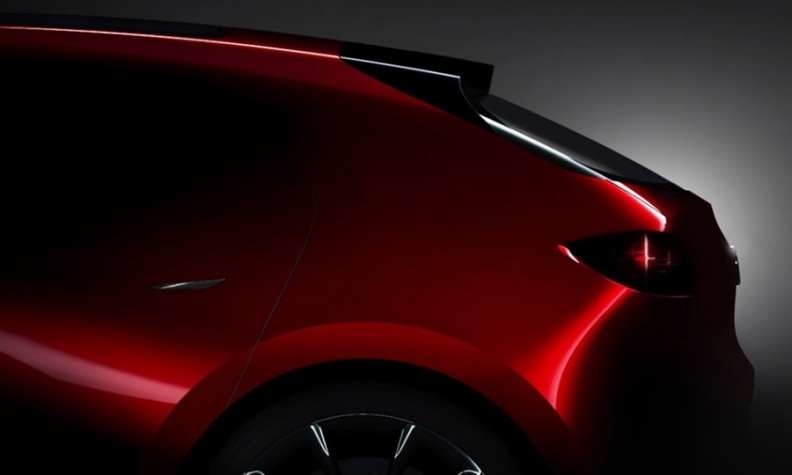 Mazda's teaser picture shot shows a compact hatchback concept that may preview the next Mazda3. TOKYO -- Mazda will showcase future trends in drivetrain technology and exterior design with two concept cars at this this month's Tokyo auto show. The cars, previewed in teaser shots released Tuesday, point to Mazda's production plans for its next-generation Skyactiv-X engine and the arrival of a new design language. The first car, a next-generation product concept, deploys the Skyactiv-X engine in a compact hatchback that may foreshadow the redesigned Mazda3, due around 2018 or 2019. The second, called the next-generation design vision, shows a new styling direction that evolves the curvy, sensuality of the Kodo design language used by Mazda since 2012. The design concept is a rear-slung sporty car with a long hood and short rear deck. 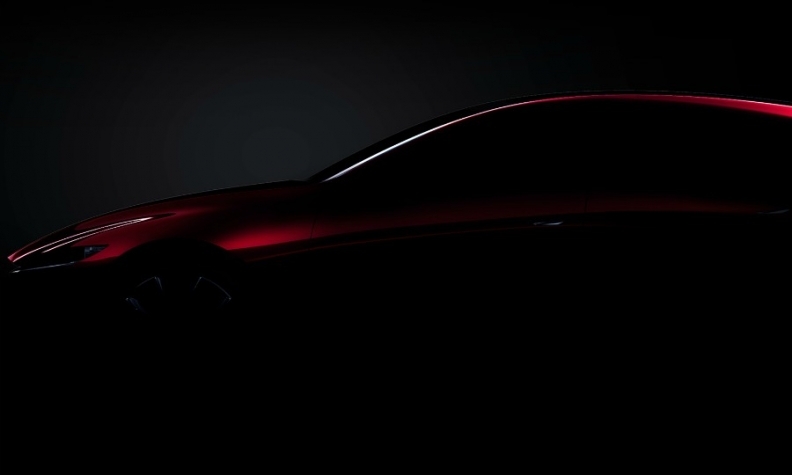 The teaser image depicts what seems like a coupe-styled sedan, in a nod to the current trend. It gets dramatic creasing along the shoulder from the headlamps to the tail. It exudes a more taunt, technical look than the rounded muscular feel of today's Mazdas. The hatchback concept shows the development of Mazda's Kodo design language. Mazda said the next-generation product concept represents the brand's "ideal hatchback." The car gets the company's new Skyactiv-X engine along with the next-generation design. Skyactiv-X was billed as the world's first commercial gasoline engine to use a compression ignition. The powertrain was unveiled in August and will hit the market in the company’s fiscal year ending March 31, 2019. A design concept teaser shows a low-slung sporty car with a long hood and short rear deck. Mazda promises the new engine will boost torque by up to 30 percent and improve fuel efficiency by as much as 30 percent over its current line of engines. Mazda is positioning Skyactiv-X as the underpinning of its next wave of products as it confronts stricter emissions regulations with little help from electrification. It uses a technology called spark controlled compression ignition, or SPCCI, to compress gasoline to such high pressure that it ignites, as in a diesel engine, without the need of spark.